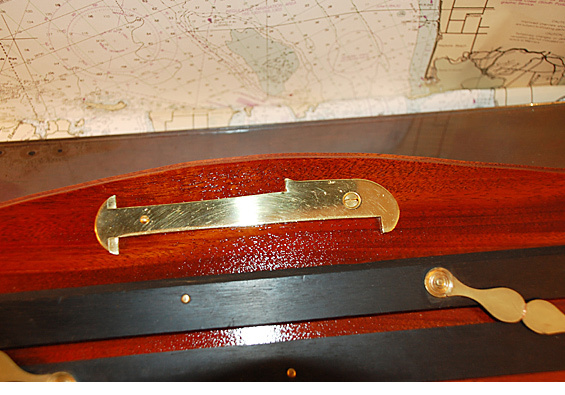 This is a unique "one of a kind" seaman's plaque… five items: ebony wood and brass parallel rule circa early 1900rds (from Canada); brass/steel dividers (60-75 years old from England); brass protractor (early 1940ties from England) and last but not least... a brass, Maine lobsta measurer (probably early 60ties). 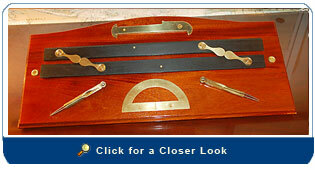 The items were completely restored and mounted on a Honduras solid-mahogany board. Size: The plaque measures 18” long and 8” high.